(heliocentric parallax) The parallax of a celestial body that results from the change in the position of an observational point during the Earth's annual revolution around the Sun: nearby stars are seen to be displaced in position relative to the more remote background stars. The instantaneous parallax of a given star is the angle formed by the radius of the Earth's orbit at the star; it varies through the year as the orbital radius varies. If the positions of a star are determined during one year they are found to describe an ellipse – a parallactic ellipse – on the celestial sphere. The annual parallax, π, of the star is equal to and can be measured from the semimajor axis of the ellipse. Annual parallax is the maximum parallactic displacement of the star and occurs when the angle Earth-Sun-star is 90° (see illustration). It is thus expressed by the relation sin π = a /d , where a is the semimajor axis of the Earth's orbit and d is the star's distance from Earth. Since π is extremely small (<1″), this reduces to π = a /d . If a is assumed to be unity (i.e. one astronomical unit) then a measurement of π in arc seconds will be equal to the reciprocal (1/d) of the distance in parsecs. The parallax of a star determined directly from a known baseline and using the principle of triangulation, i.e. 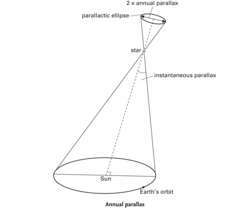 from measurements of annual parallax, is termed trigonometric parallax. Due to its tiny value annual parallax from Earth can be measured only (photographically from Earth) with reasonable accuracy for stars within about 30 parsecs (π > 0″.03). Spacecraft such as Hipparcos can measure annual parallax with a very much greater accuracy, to 0″.002, allowing distances up to 500 parsecs to be determined. Microarcsecond measurements are planned for future spacecraft. Only about 3000 stars are known to have annual parallaxes exceeding 0″.04, the nearest star – Proxima Centauri – having the greatest value (0″.772). The apparent displacement of a celestial body viewed from two separated observation points whose base line is the radius of the earth's orbit. Also known as heliocentric parallax. Choice of the star catalogue should consider both precision of the coordinates and number of stars, as well as values of proper motions and annual parallax capacity. Analogue test has been executed in order to illustrate the influence of the annual parallax neglecting, onto values of calculated apparent positions of stars. 26 light-years) is defined as the distance at which a star will show an annual parallax of one arcsecond.